For the past seven years, my session has always made Top 10 each day it is presented. This year is no exception. 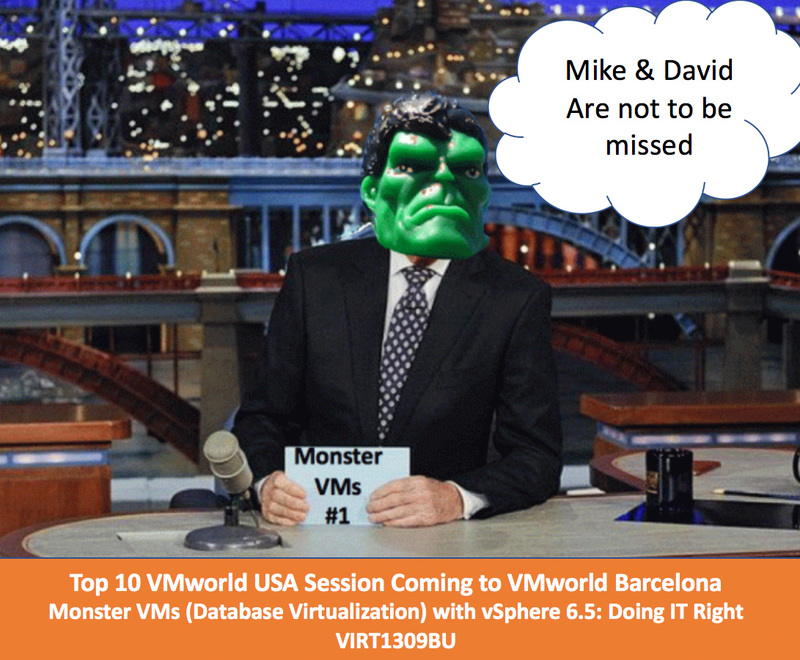 Our VMworld USA Top 10 Session Monster VM VIRT1309BU is Coming to VMworld Barcelona. The official name of the session is?Monster VMs (Database Virtualization) with?vSphere 6.5: Doing IT Right (VIRT1309BU).? For the best two years, I have presented this session with David Klee of Heraflux. David has been a wonderful co-presenter. The session will be available on this blog, after VMworld Barcelona. This session has excellent technical content and we try to make sure we have fun along the way of presenting the session.